I love Mark Bittman’s “minimalistic” view to food and recipes. I saw a slide-show in Mens Health magazine for gourmet sandwiches for guys. I may not be a guy, but I suppose I am not averse to eating like one. 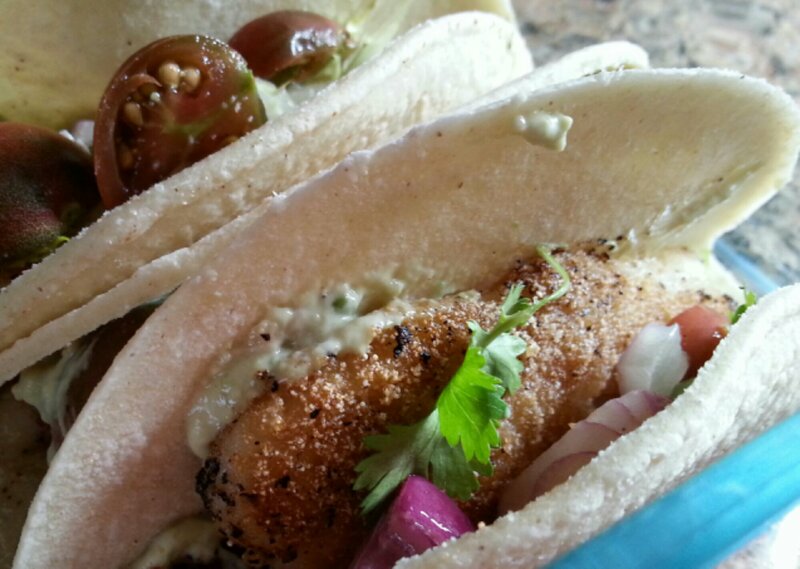 I seem to have an obsession with the idea of fish tacos. I am always suggesting them to my husband and he always passes. Hrumph. 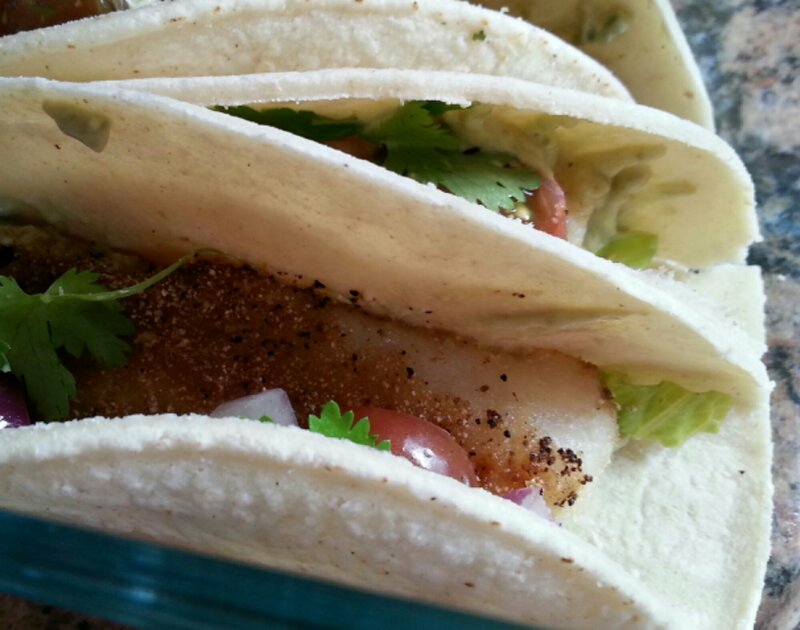 Mark Bittman thinks that I should eat fish tacos. I saw it in a magazine. Dredge a fish fillet in cornmeal and then pan-fry it until it’s crisp. Serve on a crusty roll with shredded cabbage or lettuce, chopped cilantro, sliced tomatoes. 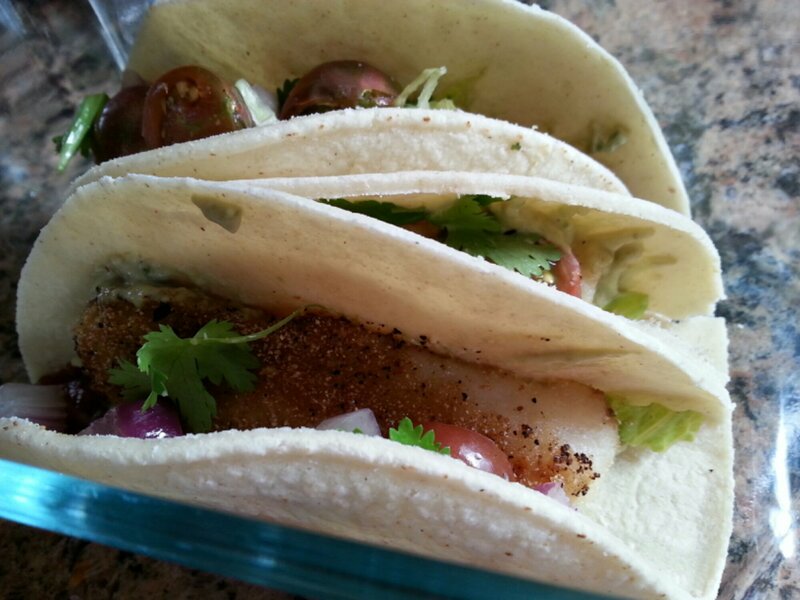 Thin some mayo with lime juice, add chili powder and minced garlic, slather the dressing on a bun before serving. Great. I have all that stuff. I also had leftover avocado-flavored mayo from 10 Burger Sauces . That would go fabulously with my fish tacos! 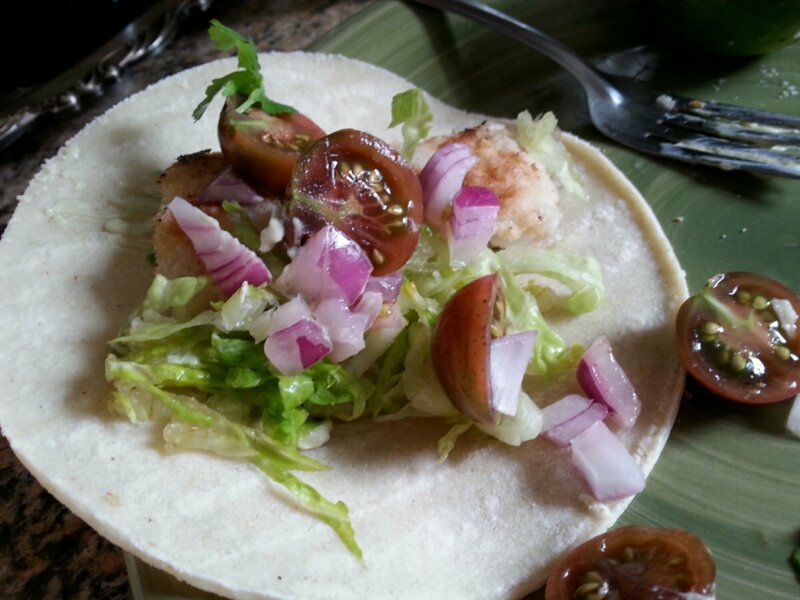 I also had some chopped red onion and some super-sweet grape tomatoes from my garden. I just ripped some cilantro leaves off their stems and I was in business. Except for the cornmeal. When I bought this house 2 years ago I had a stunning design vision and I store all my open pantry items in homey mason jars. Some are left on open shelving in the kitchen while others are tucked neatly in the pantry. One problem. I failed to label the jars. To some this may not be a huge problem, but it is for me. I have white cornmeal, yellow cornmeal, masa harina, pre-cooked masa in both white and yellow. I also have both fine and coarse cornmeal and natrelment grits. Luckily, if I lick my finger and stick it a jar to taste, I can mostly figure it out. 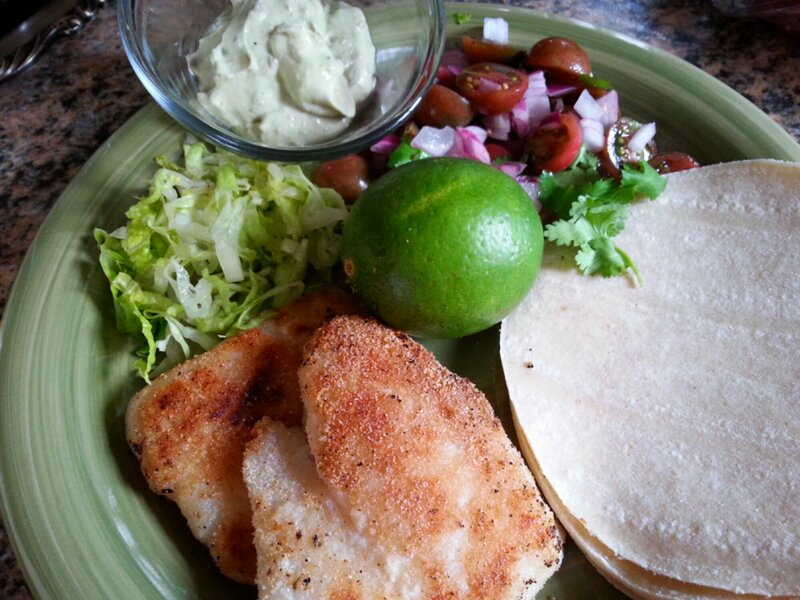 All I did was sprinkle the fish with some fresh lime juice, then dredge the fillet in cornmeal. I heated a cast iron skillet over medium heat with a little olive oil. Then I cooked the fish on both sides just until cooked through; seasoned with salt and pepper. I shredded sone romaine lettuce and set it aside. I combined chopped red onion, chopped grape tomatoes, and chopped cilantro. Also I squeezed some lime juice over that. To assemble, I spread a glob of the avocado mayo on a corn tortilla, topped with lettuce. Then I put a piece of fish on the lettuce. I spooned some of the tomato mixture on the fish. That’s it.